India's royalty lost their official powers when the nation gained independence in 1947, but there is still a great sense of romance and fascination with the men and women who once ruled large tracts of the country. However, the discourse has mostly centred around the "maharajas" or kings, many of whom are still wealthy and influential. Although there have been prominent maharanis (queens) like Gayatri Devi of Jaipur, who was instrumental in promoting girls' education in India, and featured on a Vogue list of "most beautiful women", many of India's royal women have been out of the spotlight and not much is known about them. A photography studio, Tasveer, is now trying to change that - as part of its 10th anniversary celebrations, it has collected portraits of Indian queens and princesses and is showing it in an exhibition, titled "Maharani: Women of Royal India". 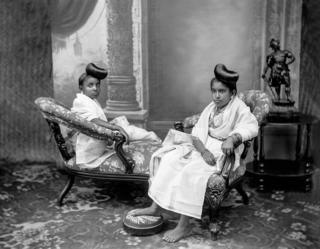 Tasveer said the pictures were sourced from the archives of the Museum of Art and Photography, royal collections from across the subcontinent and other institutional and private collections both in India and abroad such as the Victoria and Albert Museum, the National Portrait Gallery in London, and the Amar Mahal Museum and Library in Jammu.